Good afternoon, Mr. Chairman, Ranking Member Shimkus, and distinguished members of the subcommittee. Thank you for inviting me to testify today. I am Dr. John Howard, Director of the National Institute for Occupational Safety and Health (NIOSH), which is part of the Centers for Disease Control and Prevention (CDC) within the U.S. Department of Health and Human Services (HHS). I am here today to provide an update on CDC′s response to the recent Gulf of Mexico oil spill and our ongoing efforts to anticipate, monitor and respond to the potential health threats to workers and the public. On April 20, 2010, after the explosion on the Deepwater Horizon leading to the oil spill, CDC′s National Center for Environmental Health (NCEH) immediately began monitoring the situation. On April 22, NCEH staff participated in the National Response Team′s activation meeting and then formed an oil spill task force to monitor and respond to any potential public health hazards associated with the oil spill. NCEH quickly posted information for Gulf coast residents on the CDC Website describing the potential health risks associated with the oil spill and steps individuals can take to protect their health and safety. On May 10, CDC′s Emergency Operations Center (EOC) officially activated, bringing in personnel from across CDC – including staff with expertise in environmental health, occupational safety and health, and emergency response – and coordinating CDC′s efforts. NCEH is leading the EOC incident command and response activities and, together with NIOSH, is providing the vast majority of staff engaged in CDC′s response effort. As of June 14, CDC had 170 staff responding to the oil spill. Within the first few days of the response, CDC, in coordination with our federal, state, and local partners, stepped up our public health surveillance activities, looking for possible health effects that could be related to the oil spill – whether experienced by workers involved in the response and cleanup efforts or by Gulf coast residents. NCEH contacted the American Association of Poison Control Centers to request that local poison control centers code any calls related to the oil spill so that CDC is able to track the number of related calls. NCEH started using CDC′s BioSense surveillance system – which analyzes diagnostic and pre-diagnostic health data from clinical laboratories, hospital systems, ambulatory care sites, health plans, U.S. Department of Defense and Veterans Administration medical treatment facilities, and pharmacy chains – to enhance surveillance for respiratory health effects in states along the Gulf of Mexico coast. NCEH also reached out to the state epidemiologists in Alabama, Florida, Louisiana, Mississippi and Texas to ensure open lines of communication, coordinate public health surveillance activities, provide weekly summaries of surveillance findings, and work together to monitor for potential health effects related to the oil spill. CDC posted results from these collaborative surveillance activities on the CDC Website on June 10. Throughout the response to the oil spill, CDC has closely coordinated our efforts with other components of HHS – including the Assistant Secretary for Preparedness and Response, the Food and Drug Administration (FDA), the National Institutes of Health (NIH), and the Substance Abuse and Mental Health Services Administration; other federal partners like the U.S. Coast Guard (USCG), the Department of Labor′s Occupational Safety and Health Administration (OSHA), and the Environmental Protection Agency (EPA); and the Gulf coast states. CDC, in partnership with state and local health departments, is closely tracking surveillance data across the Gulf coast states for health effects that may be related to the oil spill. These surveillance systems are being used to track symptoms related to the eyes, skin, and respiratory, cardiovascular, gastrointestinal, and neurological systems, including worsening of asthma, cough, chest pain, eye irritation, nausea, and headache. If the surveillance systems identify individuals with these symptoms, state and local public health officials will be able to follow up as needed to investigate whether there is an association between the symptoms and the oil spill. This follow-up is important because the same symptoms could be related to a different cause. The agency is also evaluating data from air, sediment, and water samples in the Gulf, looking for any indication of contaminants – such as volatile organic compounds, semi-volatile organic compounds, non-methane organic compounds, metals, particulate matter, carbon monoxide, and sulfides – at levels that would pose a threat to public health. People can be exposed to hazardous substances related to the spill by breathing them (air), by swallowing them (food, water), or by touching them (skin). Individuals should avoid close contact with oil and fumes from any burning oil. Children tend to be more sensitive than adults to oil and other forms of pollution. What might be annoying to an adult could be a real problem for a child, particularly if the child is an infant or toddler, or has a pre-existing condition. If a person has concerns about a possible exposure, he or she should seek medical attention and phone the poison control center. Contact: While for most people, brief contact with a small amount of oil will do no harm, contact with the oil should be avoided. If skin comes in contact with oil, the area should be washed with soap and water, baby oil, petroleum jelly, or a cleaning paste for hands such as those sold at auto parts stores. Solvents, gasoline, kerosene, diesel fuel, or similar products to clean oil off skin should not be used. Rashes or dark, sticky spots on the skin that are hard to wash off are symptoms that indicate a person should see a doctor or other health care provider. If a person gets oil in the eyes, eyes should be flushed with water for 15 minutes. If a person swallows oil, he/she should not try to vomit it, as this may get oil into the lungs. Swallowing small amounts (less than a coffee cup) of oil will cause upset stomach, vomiting, and diarrhea, but is unlikely to have long-lasting health effects. Smell: People may be able to smell the oil spill from the shore. The odor comes from chemicals in the oil that people can smell at levels well below those that would make most people sick. However, exposure to low levels of these chemicals may cause irritation of the eyes, nose, throat, and skin. Those with asthma or other lung diseases may be more sensitive to these effects. Inhalation: If a person inhales oil vapors, or smoke from burning oil, he or she should move to an area where the air is clearer. If a person has inhaled a lot of vapor or smoke and feels short of breath, has chest pain or tightness, or dizziness, he or she should seek medical attention. Burning oil: When responders burn some of the oil, some particulate matter (PM) may reach the shore. PM is a mix of very small particles and liquid droplets found in the air. PM may pose a greater risk for people who have a chronic condition such as asthma or heart disease. If a person can smell gas or see smoke or knows that fires are nearby, he/she should stay indoors, set the air conditioner to reuse indoor air, and avoid physical activities that put extra demands on the lungs and heart. Water: Drinking water and household water are not expected to be affected by the spill. However, water used for recreation may be affected. Swimming in water contaminated with chemicals from the oil spill could cause adverse health effects. Food: FDA and the Department of Commerce′s National Oceanic and Atmospheric Administration are constantly monitoring the oil spill and its potential impact on the safety of seafood harvested from the area. The public should not be concerned about the safety of seafood in the stores at this time. Closure of the waters to fishing is the key step in preventing tainted fish from entering commerce. In addition, FDA is testing seafood at processing facilities in the Gulf region to further ensure that contaminated seafood does not reach consumers. As part of CDC′s overall response, NIOSH involvement in the oil spill response began very early. NIOSH was with OSHA and NIH′s National Institute of Environmental Health Sciences (NIEHS) in the initial HHS response visit to the Gulf during the week of May 3. Since then, NIOSH has been providing information to BP, OSHA, the Coast Guard, and other federal and state partners about protecting response workers and volunteers from potential occupational safety and health hazards. One key challenge in this public health response is that it appears that there are seven groups of workers potentially exposed to crude oil, weathered oil, chemical dispersants, combinations thereof, and other conditions that could pose hazards, and these groups are likely to have different exposure profiles. We are working to sort out these groups and their exposure differences and similarities. The groups include: (1) source control workers; (2) workers on vessels involved in burning; (3) workers on vessels not involved in burning; (4) equipment decontamination workers; (5) wildlife cleanup workers; (6) on-shore cleanup workers; and (7) waste stream workers. To protect workers and volunteers against these occupational safety and health hazards and to better understand the threats posed by these hazards, NIOSH has undertaken a number of activities, including: supporting safety and health training of response workers; developing recommendations for the use of Personal Protective Equipment (PPE); rostering and monitoring responders; collecting and evaluating occupational exposure data; conducting a Health Hazard Evaluation of workers; and researching the toxicity of potential exposures. To emphasize prevention through training, NIOSH has worked with OSHA and NIEHS to devise recommendations for worker training materials. Before being employed and before receiving an ID badge, all cleanup workers must complete between one to four training modules of classroom training, depending on their job assignment. These modules have been approved for use in this event by OSHA in compliance with the OSHA hazardous waste operations and emergency response standard (29 CFR 1910.120, and OSHA Compliance Directive CPL 2-2.51). NIOSH has been advising OSHA, BP, and other health and safety personnel about the capabilities of different types of Personal Protective Equipment (PPE), and has helped BP develop a matrix for selecting appropriate PPE. The type of protective equipment that is appropriate for each worker to use depends upon the circumstances of that worker′s particular job and the mix of oil and dispersants to which that the worker may be exposed. NIOSH also has developed fact sheets targeted to oil spill responders to describe the health risks posed by the use of dispersants and the risk of stress associated with responding to a traumatic event like this. These fact sheets are available on the CDC Website at: https://www.cdc.gov/niosh/topics/oilspillresponse/. To protect response workers from potential adverse health effects arising from their work, NIOSH recommends appropriate engineering controls (e.g., picking up tarballs with a scoop rather than by hand) and administrative controls (e.g., limiting the number of workers in areas with great exposure potential), as well as the use of task-specific PPE, including protective eyewear, clothing, gloves, and footwear. Selection of appropriate PPE requires: (1) identification of the hazards faced by workers (e.g., heat stress, fatigue, inhalational and skin exposure to crude oil and its constituents, chemical dispersants, and cleaning solvents, and musculoskeletal injuries); (2) analysis of the specific job tasks performed by workers (e.g., source control; surface control, such as laying boom, burning crude oil, and sheen busting; shoreline and marsh cleaning; and decontamination of personnel, equipment or wildlife); and (3) assessment of the risks that specific tasks present for workers. VOCs, which may be more likely to be present at or near the oil leak source, pose a greater risk of inhalational exposure than the risk encountered in “aged” or “weathered” crude oil that may be encountered on or near the shoreline. Weathered crude contains mostly higher molecular weight, very low volatility hydrocarbon constituents of crude oil. When oil is deposited on shore, use of gloves and protective clothing to prevent dermal contact is recommended, but such deposits (referred to as “tarballs” or “tarpatties”) are unlikely to pose inhalation risks. So, recommendations for respiratory protection and other PPE are not clear-cut and will vary depending on the characteristics of the oil, the type of work being done, and the magnitude of exposure. NIOSH and OSHA are currently working together on a respiratory protection policy. It is important to note that in recent years several studies of previous oil spill response efforts have reported acute and chronic health effects in response workers. These studies may underestimate the health effects associated with oil response work since the magnitude and duration of the Deepwater Horizon response is unprecedented. At this time, there has been no comprehensive assessment of all response worksites in the Gulf, and as a result, we have an incomplete understanding of the human health toxicity associated with exposure to large amounts of dispersants and the toxicity associated with mixed exposure to large amounts of crude oil and dispersants together. This means that knowledge about potential exposures to the mixed exposure of crude oil and dispersant associated with the Deepwater Horizon response work is still evolving. Therefore, NIOSH believes it is prudent to reduce the potential for such adverse health effects by the responsible use of administrative controls and PPE. NIOSH is administering surveys to thousands of response workers who are participating in the recovery efforts in an effort to compile a roster of individuals involved in the response. The purpose of this roster is to obtain an accurate record of who is participating in the cleanup. The information collected in this roster would be vital for possible future studies to determine whether health conditions that may develop in the future are associated with occupational exposures during the cleanup. A roster is an important tool to capture site-specific information, such as a worker′s job task, time on task, available exposure information, use of PPE, and other related factors. Participation in the survey is voluntary, and once the information is collected, NIOSH will protect individuals′ personally identifiable information as confidential to the extent allowed by the law. It has been challenging to enroll workers due to the different locations of the training sites. To date we have visited all the staging areas in Louisiana to roster workers, and we are currently enrolling workers in Mississippi, Alabama, and Florida. Through our rostering efforts, we have already captured information from more than 11,000 workers responding to this event. In an attempt to reach all cleanup workers, the survey is being administered in English, Spanish, and Vietnamese. 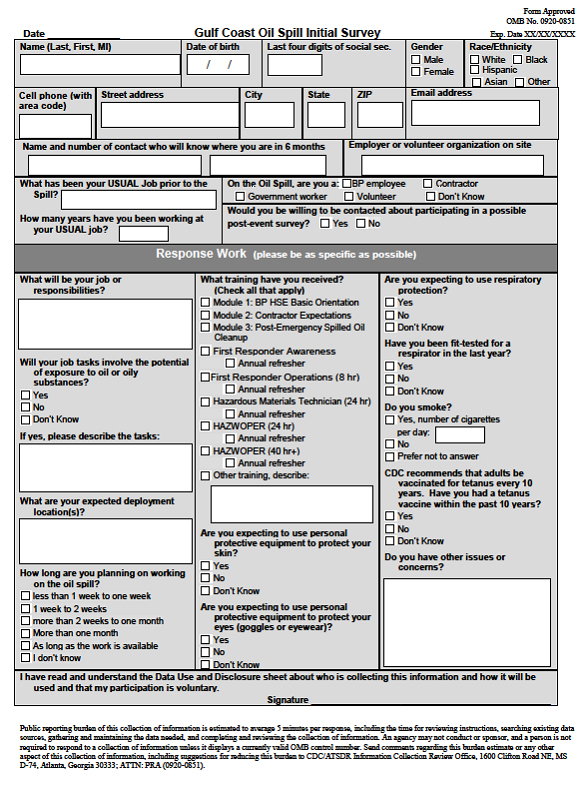 A copy of the survey is included as Exhibit 1. Scientific/epidemiologic industrial hygiene data collected from workers in the workplace (i.e., measures of physical, biological or medical conditions in the workplace which may possibly be harmful) through a Health Hazard Evaluation that NIOSH is conducting. Injury and illness data on BP′s employees, contract employees, federal, state, and local responders, and volunteers who seek care at a BP medical facility. NIOSH is recoding BP′s data into a standardized reporting format. NIOSH has a unique opportunity to assess these occupational safety and health hazards and others that may arise as we conduct a Health Hazard Evaluation (HHE) of reported illnesses among workers involved in offshore cleanup operations, as requested by BP on May 28. Several NIOSH staff members have been deployed to the Gulf coast to work on this HHE, including industrial hygienists, who are assessing exposures through observation, industrial hygiene assessments, and evaluation of work practices and use of PPE, and medical officers, who are evaluating illnesses and injuries among groups of offshore workers. The Louisiana Department of Health and Hospitals has agreed to provide medical reports of seven previously hospitalized fishermen for NIOSH physicians to review. Once the HHE is completed, NIOSH will compile the findings and recommendations in a report that will be provided to employer and employee representatives, and it will be publicly available on the NIOSH Website. NIOSH is also conducting laboratory research to address reports of workers with respiratory symptoms and headaches by initiating toxicity studies of both crude oil and chemical dispersants. This research will seek to determine the acute pulmonary, central nervous system, and cardiovascular responses to inhalation of dispersants, oil constituents, and the combination of the two, and the results will help inform the development of prevention strategies. We anticipate that preliminary data may be available by the end of the summer. NIOSH also has proposed a study to address concerns regarding skin exposure and the handling of oil during beach cleanup. Regardless of the final size and extent of the spill, it is already evident that response and cleanup activities will be underway in the Gulf for an extended period of time, and thus we must remain vigilant to protect response and recovery workers, volunteers and the public from potential exposures to oil, its constituents, and dispersants. CDC continues to work diligently to protect the health and safety of workers and residents along the Gulf coast. This oil spill underscores the importance of CDC′s work and the continued need for further health and safety research. It is important to protect against potential health hazards now so that we do not have to study chronic health effects associated with this spill in the future. Therefore, the occupational and environmental hazards associated with the oil spill must be identified, monitored, evaluated and addressed. As this situation evolves and we learn more about the potential health hazards, CDC will update our recommendations for how to protect the health of those living and working along the Gulf coast. I appreciate the opportunity to describe CDC′s response activities in the Gulf of Mexico. Thank you for your continued support. I am pleased to answer any questions you may have.